Having spent a good decade of my life in Manhattan, I decided to use Woodford Reserve’s “Manhattan Project” as an opportunity to pay tribute not only to the granddaddy of all classic cocktails but to the many facets of the island that has meant so much to me over the years. New York City is the epitome of the American melting pot, and bourbon is the quintessential American whiskey, so the marriage of ideas seems fated in the stars. My brainstorming began with the idea that we should recognize the “melting pot” aspect of Manhattan by using ingredients from many different places. 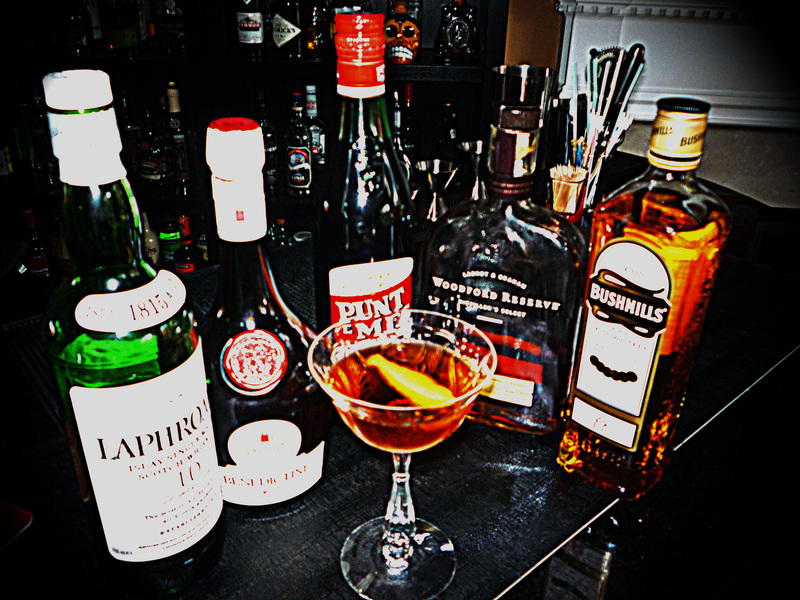 However, the last thing we’d want to do would be to weigh down a classic like the Manhattan with clashing flavors. That’s when I hit upon the three whiskeys idea. Like the bridge that connects Manhattan to the Bronx and Brooklyn, the use of Woodford bourbon, Bushmill’s Irish whiskey, and Laiphroaig Scotch create a bridge that brings all the ingredients to create a unified whole. Compared to other bourbons in its class, Woodford is noticeably sweet with distinct notes of caramel, vanilla, and butter. The dryness of the Bushmill’s balances the sweetness and is a perfect match because, like Woodford, Bushmill’s is triple distilled in a pot still. Just a few drops of Laiphroaig are added at the end to provide an aroma and light taste of smoke. One can imagine the atmosphere of a West Village poetry reading in a smoky coffee house. A Manhattan also needs vermouth and bitters to round it out. We chose Punt e Mes because its slight bitterness and chocolate notes would play well with the whiskeys. We added a small amount of Benedictine to provide a bass note and appeal to the entire palate. In my opinion, a Manhattan is a serious drink and therefore does not need a flashy garnish. However, a little citrus oil really helps to brighten the brooding nature that the Punt e Mes and Benedictine bring to the table, and the flavor of orange plays well with the chocolate notes in the Punt e Mes. This entry was posted in bourbon and tagged drinkwire.